There’s nothing quite as comforting as ribbons of pasta dripping with sauce. 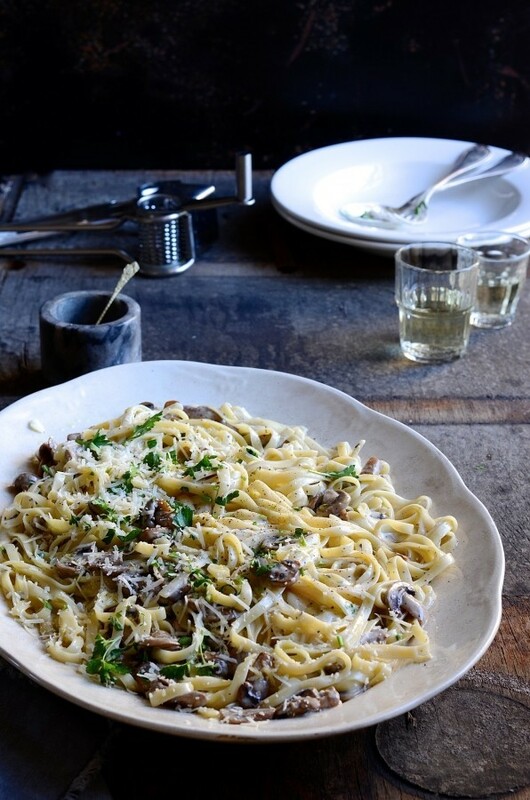 Add a panful of meaty mushrooms sautéed in white wine with woody herbs and dinner is sorted. 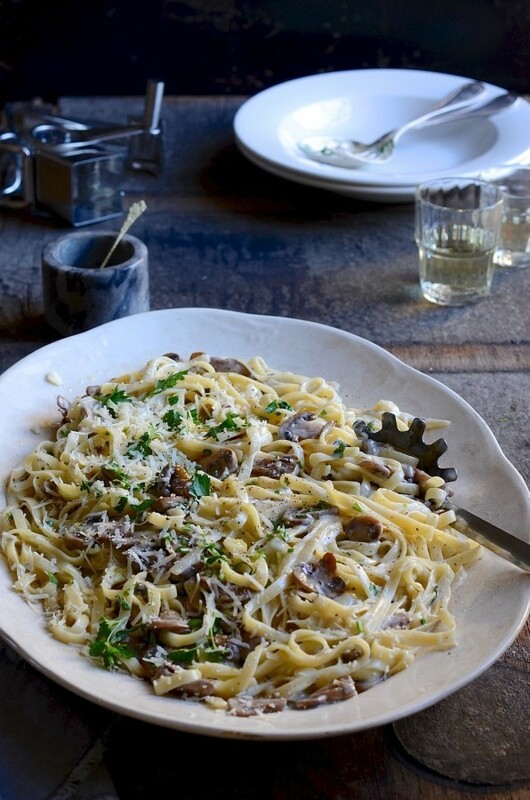 It’s my simple yet very satisfying Lemon cream mushroom tagliatelle pasta. Hearty food for easy midweek suppers. Pasta is possibly one of the best flavour carriers. These starchy strands act like a carb-sponges, readily absorbing flavourful sauces. Back in the seventies, plain pasta came neatly nestled in bowls with the sauce spooned rather awkwardly on top. Adopting traditional Italian practices, we’ve come to appreciate that the sauce and pasta work best tossed together in the pan. This method ensures that your first mouthful will be as tasty as the last. What makes this pasta different from a more traditional alfreddo, is the sauce. It starts out with a basic béchamel. To bolster the taste, I add lemon zest plus some juice, freshly grated parmesan cheese and cream. With the lemony sauce done, you can get on with frying the mushrooms. The meatiness of mushrooms replaces the need for protein and is a great source of essential B vitamins. You can use any combination here. Dried porcini mushrooms will add a distinctive umami flavour to the pasta. 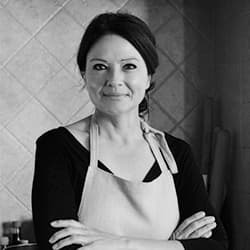 I’d pair it with fresh cultivated mushrooms so that the flavour doesn’t overwhelm. The most challenging part of tonight’s supper is to cook the pasta al dente – firm to the bite. 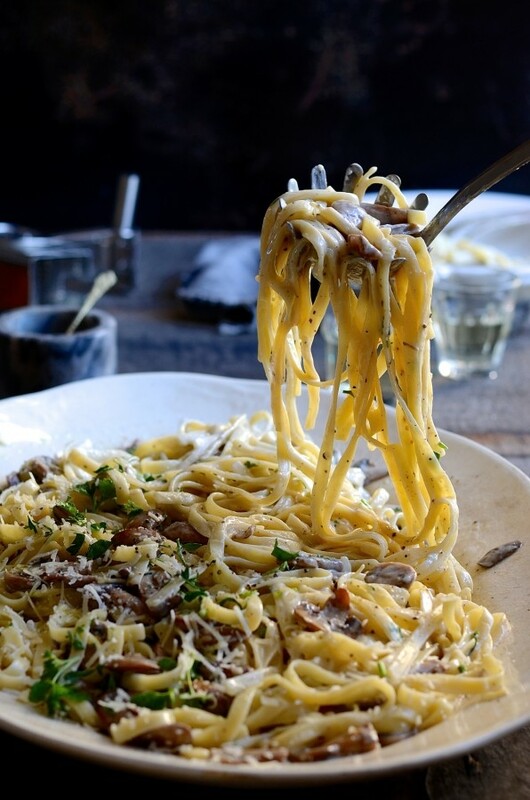 Once the tagliatelle is just tender, drain and toss with the mushroom sauce. Pasta waits for no one, so be sure to gather the clan at the table, forks and spoons at the ready. 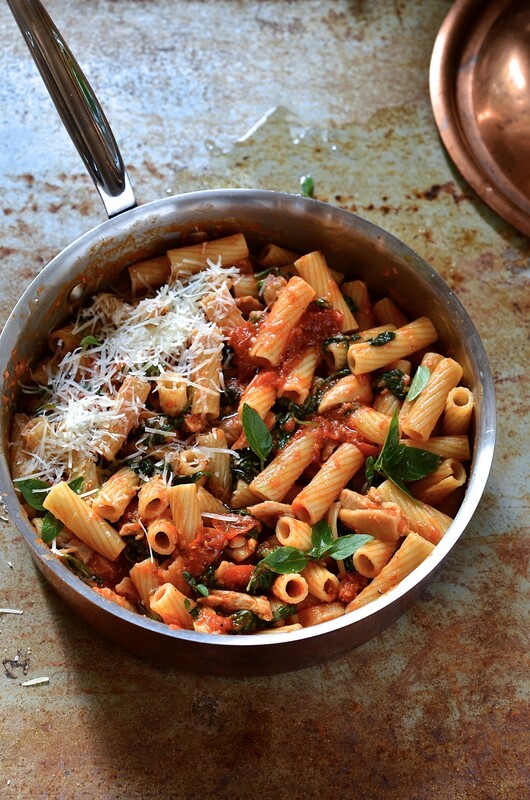 Scatter liberally with flat leaf Italian parsley and don’t be shy with the parmesan either. Easy comfort food to see us through the last of winter’s chilly nights. Cook the pasta in plenty of rapidly boiling, salted water. Reserve 1 1/2 cups of the pasta water to thin out the sauce. That looks absolutely scrumptious- a must try for me. I’m with you Les. It’s hard to refuse a bowl of pasta. Best opportunity to add more of my favourite cheese! 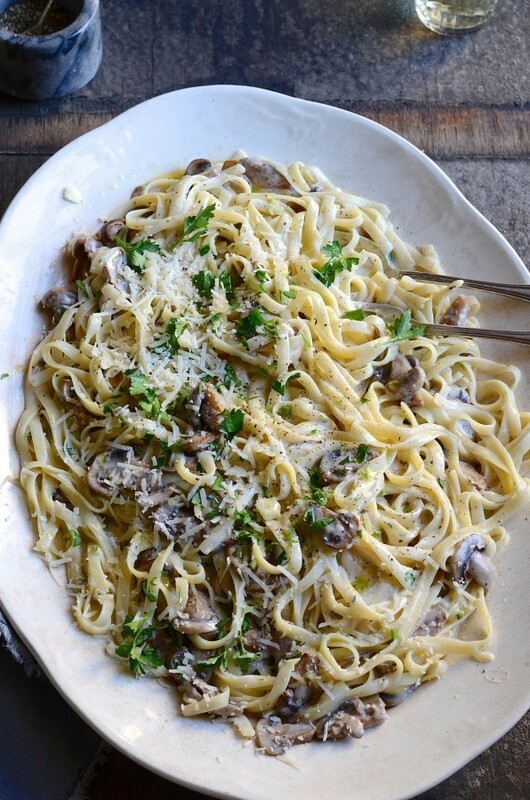 Somehow pasta is always on the list of best comfort foods. I also love making this dish for a crowd. Simple yet very satisfying.